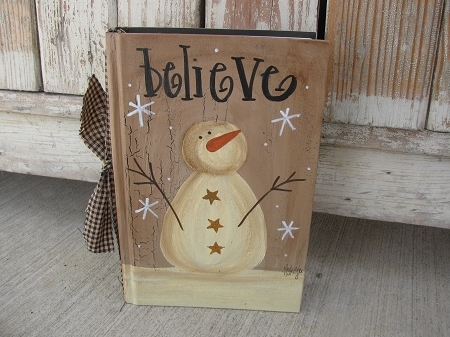 Primitive hand painted vintage reading hard covered book with a great winter snowman design. Simple and primitive. Antique white snowman on a khaki tan crackled background surround by falling snowflakes. The saying is Believe. The snowman is also shown with star buttons. Book sizes vary as I use real vintage/antique hard covered books. Most are about 5"x7". The binding has some homespun fabric tied on, not glued. Books are a unique decor item to stand up on end tables, cabinets and more. A decoration you won't find anywhere else! Hand painted, designed and signed by Heidi.